The race is on! A Blackjack Leaderboard contest has just begun at Juicy Stakes that will award $888 in prizes to the top 20 players with the most blackjacks. Juicy Stakes is actually better known for online poker room but it has a full featured online casino as well. Blackjack is just one of dozens of games in Juicy Stakes’ casino including Roulette, Baccarat and slots. Its Blackjack tables will certainly be busy this month though as players compete for$888 in prize money. The player with the most blackjacks will win $100 and the second place player will get $75. Blackjack players will earn points for every blackjack they hit – traditional Blackjacks, not a combination of cards totalling 21. They’ll get one point for every dollar bet. Juicy Stakes recently upgraded its Blackjack software which now has Auto Play, Speed Control and optional Strategy Tips coaching -- which is great is you're not really experienced in Blackjack. It can be played full screen or, if you're playing poker at the same time, a Mini version is available. Use the Instant Hand History feature to review the choices they made in previous hands. 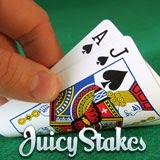 Juicy Stakes will also give away $20,000 to its top FPP (Frequent Player Point) collectors as it does every month. The top 100 players will get prizes up to $500 each. Get the most blackjacks and win up to $100..